As the licensing authority and waterway manager for urban waterways within the Melbourne region, Melbourne Water has developed draft technical guidelines for stormwater harvesting structures. 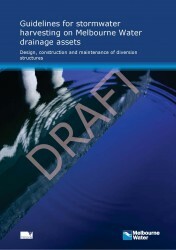 The guidelines are designed to provide practitioners with guidance on Melbourne Water’s requirements for stormwater harvesting schemes on Melbourne Water assets and recommend options for the design, construction, operation and maintenance of diversion structures. Comments and feedback can be emailed to Melbourne Water or to IVWater (the consultants) directly. The project team is particularly interested in understanding whether the industry sees the guidelines as useful and relevant in the stormwater harvesting field. The consultation process is open until Tuesday October 20, after which the guidelines will be finalised and made publicly available. Friday October 16, 12.30pm – 2.30pm at Melbourne Water Docklands office (990 La Trobe Street). Register your interest if you would like to attend.